There was a point early on in Skyfall when I realized that I was watching something special. And steadily throughout the rest of the film a certain feeling relentlessly grew. Skyfall is an astonishing movie. Not just astonishing for a James Bond movie, but astonishing, period. It is the epitome of a four-star movie and by leaps and bounds my favorite film of 2012. This film starts with James well-established in the role of 007, but in a curiously passionless way. He is frustrated with the MI6 structures, butting heads with M, and I got the sense watching the opening sequence that he was… going through the motions? It was like he was a man pretending to be Bond instead of actually being Bond. Still here and there I could catch glimpses of the true Bond starting to flicker through, like when he leaps onto a moving train from an excavator and nonchalantly adjusts his cufflinks. But then the opening action sequence ends in a way that is very unlike a James Bond movie, and we're brought into the credit sequence, and here is where the movie dug its fingers into my heart. The Skyfall theme song by Adele is stunning and gorgeous, lush and haunting, easily the best theme song since The World Is Not Enough. And the visuals are a striking montage of a lost James, hunting at his own shadows, and the haunting, looming presences of a graveyard, an old mansion, and an antlered buck. I knew watching this sequence that this was something special, something new, something I hadn't felt at a James Bond movie since the over-the-top audacity of Goldeneye. Because of the way the opening action sequence ends, this James is given an out... which he takes. But if you take the Bond away from James, what is left? What could possibly fill the thrill of being Bond? James tries his old standbys: booze and women, with some dangerous gambling thrown in. But when he learns of an attack on MI6 he finds himself drawn back even though now he's basically an empty, broken, husk of a man. Even though he fails every physical and psychological test, M puts him out in the field to solve this case. Why? Because she now sees what we see: that this is the man who is not yet—but will become—Bond. Her instincts tell her to let him become what he will become. And so the film becomes a journey, a continual breaking down and building up of what exactly it means to be Bond. And in a surprising third act (that I really did not see coming at all), the very history of Bond is pulled out of the past directly into the present and (literally) destroyed, freeing this man at last to become Bond. Before this movie Pierce Brosnan was my favorite Bond. Brosnan's Bond was an almost tragic figure. It seemed like at one point he used to be a regular person, but then he put on the Bond mask and got lost in it. But every once in a while a crack or two would show in the mask and you could catch a glimpse of the real person back in there, only to be quickly subsumed. But now Daniel Craig has become not a mask of James Bond, but the true James Bond upon which the mask is based. Whole and wholly. At the end of Skyfall, this character is no longer a man playing at being Bond. At long last, after three movies, we witness the birth of James Bond. The one and only. Skyfall succeeds in doing something that hasn't ever actually been tried before in a Bond film: having a resonant emotional core. And a surprising amount of suspense. Traditionally in Bond films you aren't really that worried about Bond. He's Bond, after all; he can do anything and nothing bad will ever happen to him. But early in Skyfall all of that is thrown out the window; James is broken (and after all he hasn't really become Bond, not quite yet). But not only are you worried about Bond, you're worried about Judi Dench's M. M is really the co-star of this film; it is as much about her as it is about Bond. She becomes a surprising mother figure to Bond, and their relationship becomes something wonderful that makes you care about the welfare of both of them. And as such the tension of the movie grips you early and just tears at you. Javier Bardem plays a villain worthy of this movie, as an older operative of M's who went off the rails and forced M to abandon him. Now he's come back for revenge. It's terribly personal. He sees M as a deadbeat mother, and Bond as the step-brother who is getting all of mother's love but is destined to receive the same abandonment. What he doesn't see is that everything that happened to him is his own fault, not M's or James's. He's like a petulant child who is incapable of accepting responsibility for his own misfortunes. But he is smarter than James, he knows he is smarter than James, and everything he does just manipulates James into furthering his own goals. Until that surprising third act, when James and M finally decide to take their fate into their own hands. The third act is an ingenious inversion of the typical third act of the Bond movies, where Bond finally storms the villain's hideout (often after having been captured and taken there forcefully). It is gleeful and scary and shockingly emotional. And also explains in a surprising way why the film is called Skyfall. Skyfall is also one of the most beautiful films I've seen in recent years. The sets are stunningly filmed and lit. A neon-and-glass fight in a Shanghai skyscraper. A lantern-lit boat journey into a dragon casino. A chalky, deserted-island villain fortress. It is all luscious and scrumptious and candy for the eyes. And as a James Bond nerd, I loved seeing all of the traditional trappings of Bond creep back into the movie series after such a long absence. There at last is Q. Here is this character, this location... why do they seem so familiar, so nostalgic? I could feel something building in the back of my heart, and then finally in a masterful final scene, pieces of the movie start clicking into place like a giant clockwork puzzle that had been slowly spinning into place the whole time without me even noticing. There is that desk... there is that door... that office... click-click-click, and finally not only are we watching the birth of James Bond, but we are watching the birth of the James Bond movie. 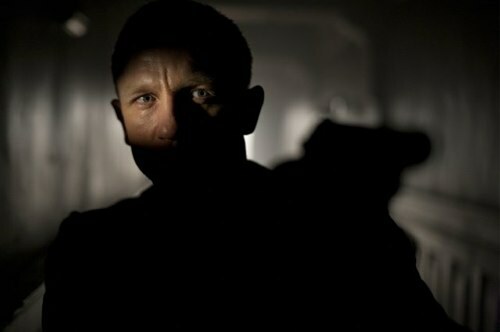 Skyfall is now easily my favorite Bond film, dethroning the wonderful-in-a-different-way Goldeneye. Who would have thought there would ever be a Bond movie that is totally new and yet drenched in nostalgia? And who would ever have thought that there would be a Bond movie that brought me to well-earned tears? And as for the next installment of Bond, I am (as Bond himself says) "Eager."